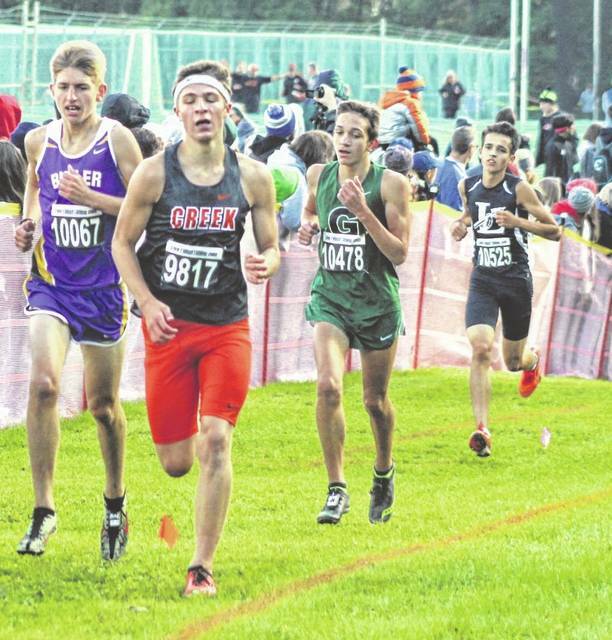 Greenville sophomore Riley Emerick (third from left) tries to keep pace with the runners in front of him during the Greater Western Ohio Conference cross country championships on Saturday at Northmont High School. Emerick finished 22nd overall in the boys race. 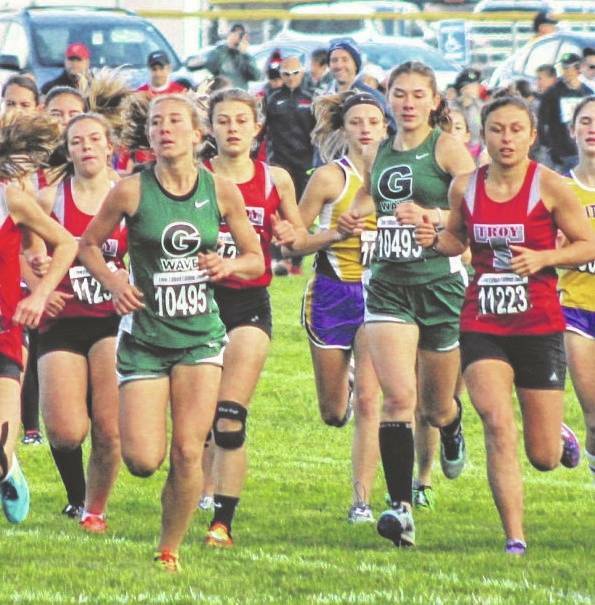 Greenville sophomore Isabelle Rammel (left) and senior Lauren Dull (right) move into the middle at the start of the Greater Western Ohio Conference cross country championships on Saturday at Northmont High School. Rammel finished in 16th place overall and Dull placed 75th for the Lady Wave. Greenville runners Matt Karns (left), Jacob Watson (center) and Alex Subler (right) run as a pack early in the race at the Greater Western Ohio Conference cross country championships on Saturday at Northmont High School. Karns finished in 68th place, Watson placed 76th and Subler finished in 78th place for the Green Wave. Greenville sophomore Isabelle Rammel nears the finish line during the Greater Western Ohio Conference cross country championships on Saturday at Northmont High School. She finished in 16th place overall. 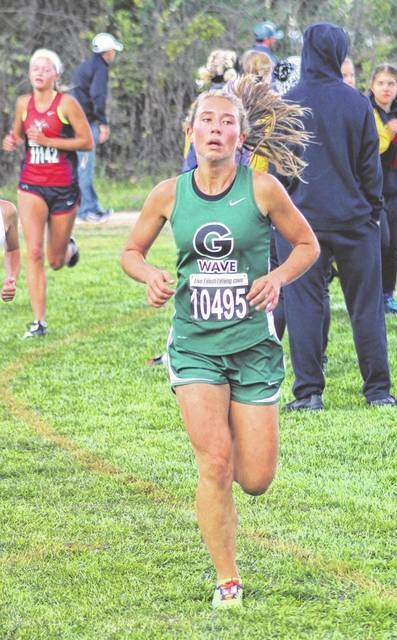 Greenville senior Lauren Dull nears the finish line during the Greater Western Ohio Conference cross country championships on Saturday at Northmont High School. She finished in 75th place overall. Greenville sophomore Riley Emerick nears the finish line during the Greater Western Ohio Conference cross country championships on Saturday at Northmont High School. He finished in 22nd place overall. 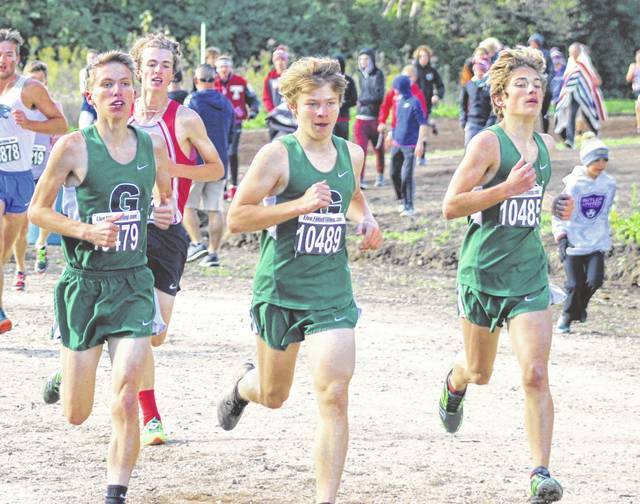 CLAYTON – The Greenville cross country teams are right where they were hoping to be heading into the Southwest District championships next weekend. The boys and girls runners showed that this past Saturday by reaching numerous PR’s at the Greater Western Ohio Conference meet on Saturday at Northmont High School. For the boys, sophomore top runner Riley Emerick scored a PR time of 16 minutes, 46.8 seconds – his old PR was 16:52 – in placing 22nd overall at the GWOC meet. When you break the 20-team GWOC into its two leagues, Emerick was the fourth-best runner in the American League. Emerick said in about the last 800 meters of the race, he tried to keep up with the runners in front of him, but they just pulled away. The boys as a team finished in 12th place overall in the GWOC and were fourth in the American League behind Tippecanoe, Vandalia Butler and Troy. Also scoring PR’s for the boys team were Matt Karns (18:01.1) in 68th place, Seth Shaffer (18:02.8) in 70th place, Jacob Watson (18:10.8) in 76th place and Alex Subler (18:11.6) in 78th place. Coach Stephanie Lind was thrilled with the tight pack her Nos. 2-5 runners finished in. The four competitors were separated by just 10 places and 10.5 seconds. Several girls also PR’d at the meet including top runner sophomore Isabelle Rammel, who finished in 16th place overall with a PR time of 19:35.8. Senior Lauren Dull also had a PR time of 22:49.6, which earned her 75th place overall. “It went all right,” Rammel said after the race. “I was hoping to run a little faster, but I just was a little off today. Hopefully I will run better next week at districts, but overall it was pretty good. I was aiming to stay with the girl from Tippecanoe and I think I ended up beating her. Lind believes her runners are in great shape too heading to next week’s district championships. “We are right where I want us to be going to districts next week,” Lind said. “I think they all are kind of looking now at where they need to do some work after the race today. We had some really fast first miles today and if they can learn how to stay relaxed in the middle of the race that will serve them well. The district meet will be held next Saturday at Cedarville University. The Greenville boys will compete in the Division I race which begins at 10:45 a.m. The girls will run in the Division II race which starts at 11:30 a.m. This entry was tagged Greenville Green Wave, GWOC. Bookmark the permalink.